Experience therapy from the comfort of your own home. With 4000+ licensed therapists across the USA and four ways to connect - text, chat, phone, and video - you can start getting help in under 24 hours from anywhere worldwide. It's a truly affordable, convenient, and healthy way to better your life. Simply fill out the questionnaire and get matched with the perfect counselor for you. 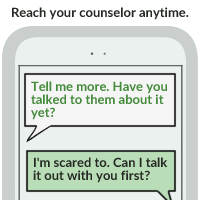 If you're not happy with your counselor you can request a new one at any time at no additional charge. Financial aid is available for those who qualify. Get started today and receive 10% off with coupon code "couponsurfer".